This house was, at least during its first half-century of existence, the home of notable people. It was built in 1849 for Province of Canada legislative councillor Philip Henry Moore (199-1880). He used it as his holiday residence and he lived there anytime his political duties gave him a break. Philip was Nicholas Moore’s son who arrived here in 1801. He was born in Rhinebeck in what was then the Province of New York. After a succesful carreer as a merchant in Bedford, he was named Judge of the Peace and later became one of the 24 legislative councillors appointed for life by the British Governor of the Province of Canada, upon its creation. The very real political power of this body of councillors got steadily chipped away by the elected deputies forming the Lower House. As a Councillor, Philip chaired a commission in charge of deciding whether or not the victims of the Patriots’ insurrection’s repression ( 1837-1838) should receive financial compensation. To the utmost dismay of his Tory colleagues Moore recommended a substantial compensation, which did not do much to improve his relations with some of the english-speaking members of Parliament. P.H. Moore left his home to Hiram’s children, Willoughby, Mary and Ellen. These, in turn, sold it in 1874 to two Montreal businessmen, David Campbell and Edward Langley Bond. The latter was a son to the anglican bishop of Montreal and made a fortune in maritime insurance. Thus, the Moore house was, at least from 1849 to the end of the XIXth Century, the home of very affluent people. 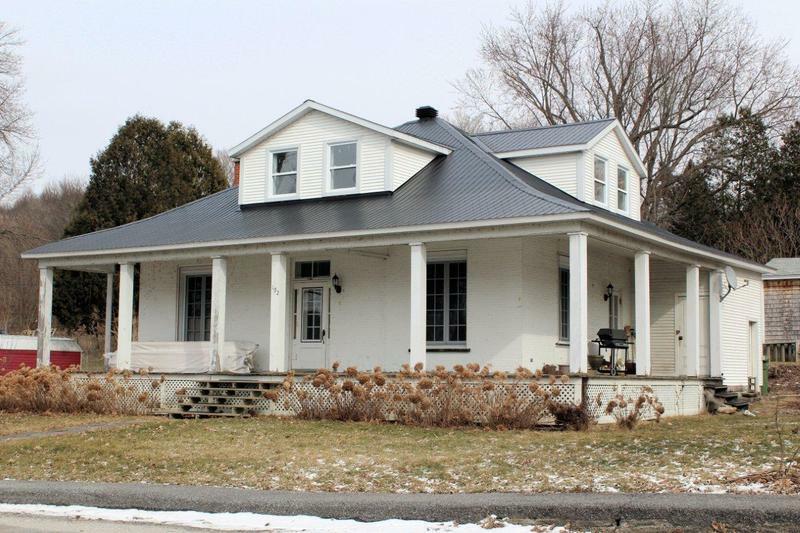 This house is a fine example of a Regency Cottage, with its hip-roof and wraparound porch.